Sunset Studio is the home studio of Joe Lapiana who also maintains a studio #326 at Western Avenue Studios at 122 Western Avenue, Lowell,MA. The studio can be visited during the First Saturday of every month during Open Studios from 12 Noon until 5:00PM or by appointment. Last Friday, 7-2-10 several of the Nashua Area Breakfast Club Artists met in Hollis, New Hampshire to paint Plein Air. This is my painting of "A House On Monument Square. It was so much fun to paint outdoors with a group of artists who each chose a scene to paint. Some of us painted the same scene from different angles. We will repeat the plein air experience each Friday as weather and time permits. It's summer and all thoughts turn to the beach. This painting which is called The Dunes is an 11X14 Oil on Canvas. 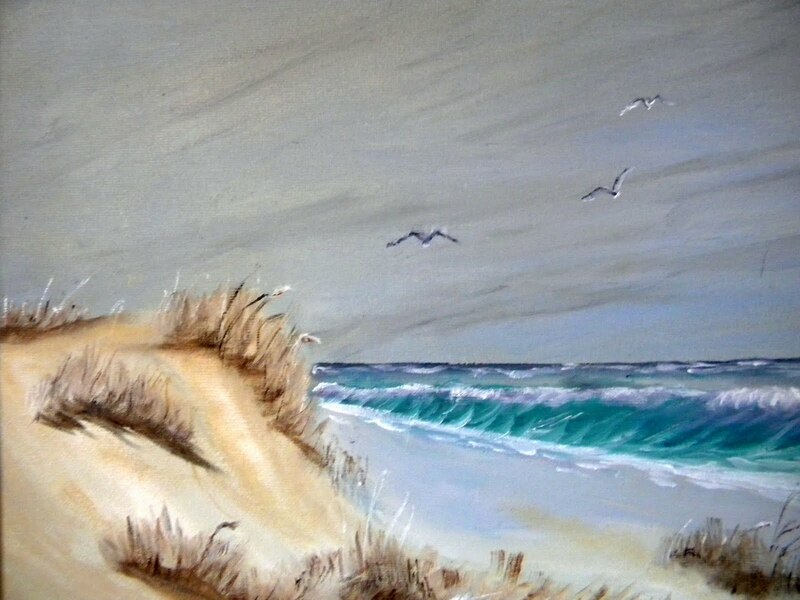 It was inspired by two of my favorite beach spots in New England, the sand dunes at Crane's Beach in Ipswich, Massachusetts and the Province Land dunes just outside of Provincetown in Cape Cod, Massachusetts. I am pleased with the overall composition, movement in the ocean, and the mood of a windy day at the beach. The painting is available as an original or a giclee print. Just a quick post to invite all that are around for the 4th of July to visit the 42nd Annual Chelmsford 4th of July Art Festival. Many of my art friends have pieces being shown at the festival. 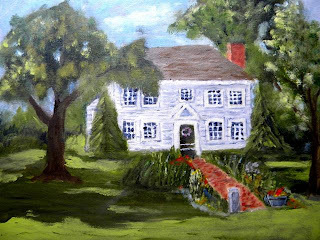 I have submitted three pieces this year Summer Flight (Dragonflies) a 16X20 Oil on Canvas, The Gazebo at Mill Pond In Graniteville (Westford) a 16X20 Oil on Canvas, and Fishing at East Boston Camps (Westford) an 11X14 Oil on Canvas. The Festival is open to the Public July 4th Sunday 6-10:00 PM and Monday, July 5th from 8:30AM until 1:00 PM. Come by and enjoy the art as well as the festivities across the street on the common. The Art Festival occurs in the Old Town Hall, 1 North Road, Chelmsford (in Chelmsford Center). After working as a science educator and administrator for more than 34 years, I am now persuing second career options and enjoying time to live life in more exciting and fulfilling ways.